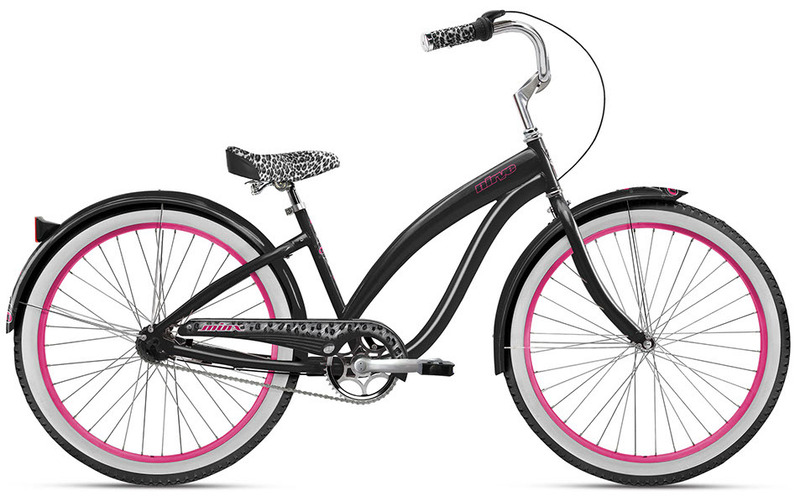 Looking to buy a cruiser for my wife. She rode a 3 speed internal and won't use anything else. 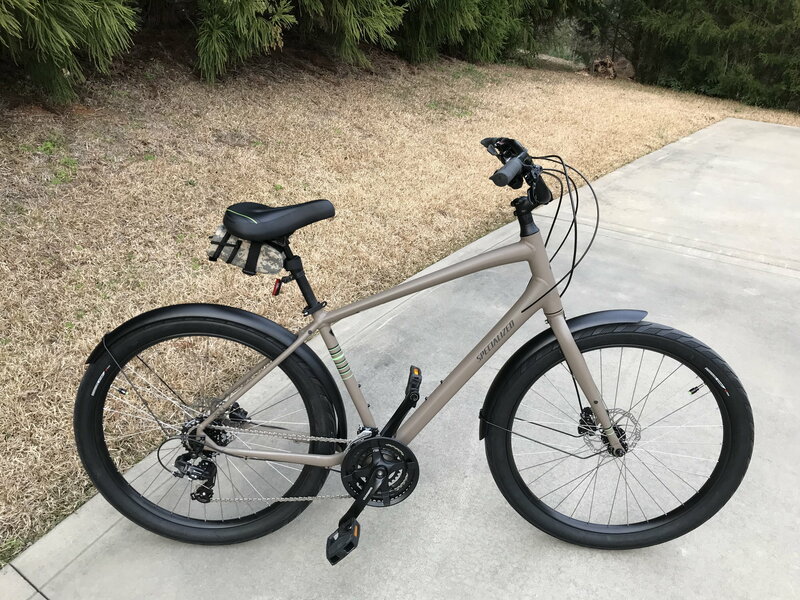 Shopping is confusing because there are so many brands that I'm not familiar with, and you never know if more money equals more bike.. Could someone recommend a couple of 3 speed bikes to me in the $300-$600 range? Thanks for looking, and happy cruising!! Can't go wrong with an Electra. This forum is not "everybody" but a few people's Opinions ... carry on..
Will definitely check out the Lux, thanks for the suggestion. Obviously I'm not buying it if she hasn't ridden it first. 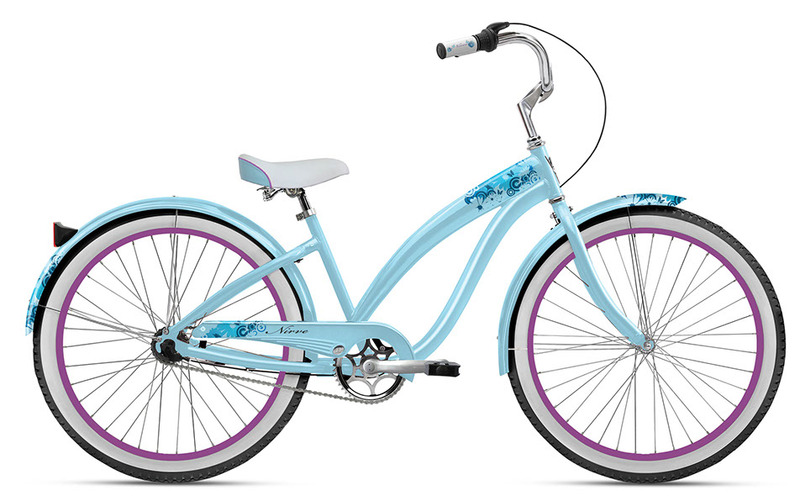 She wants a townie 3I, but she doesn't like any of the available colors. The Lux is an upgraded Townie, she'll like it, plus it's cuter. Same frame geometry on both bikes though. My wife's sole criteria for choosing a bike is color. 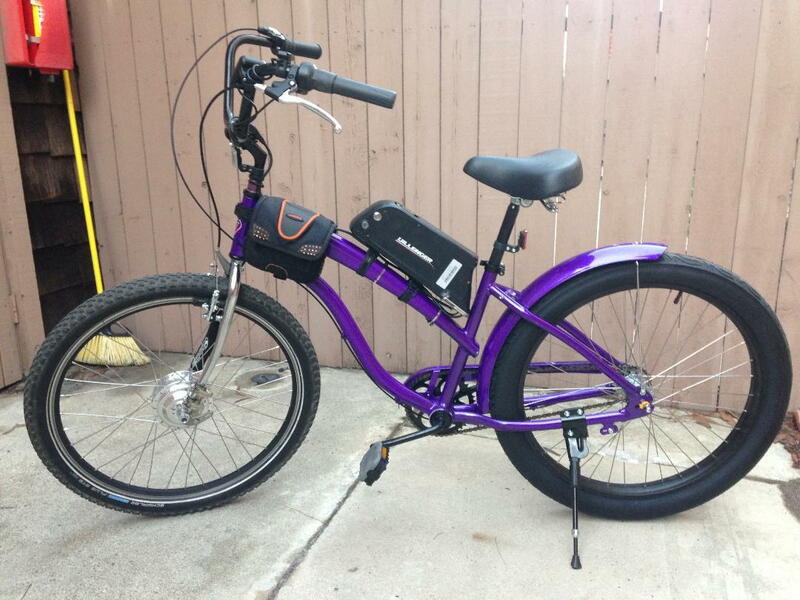 Sitting here thinking, if your wife likes cutie pie bikes, take a look at a Nirve 3 speed. Blue bike. The piping on the saddle matches the rims. That's a pretty cool detail. 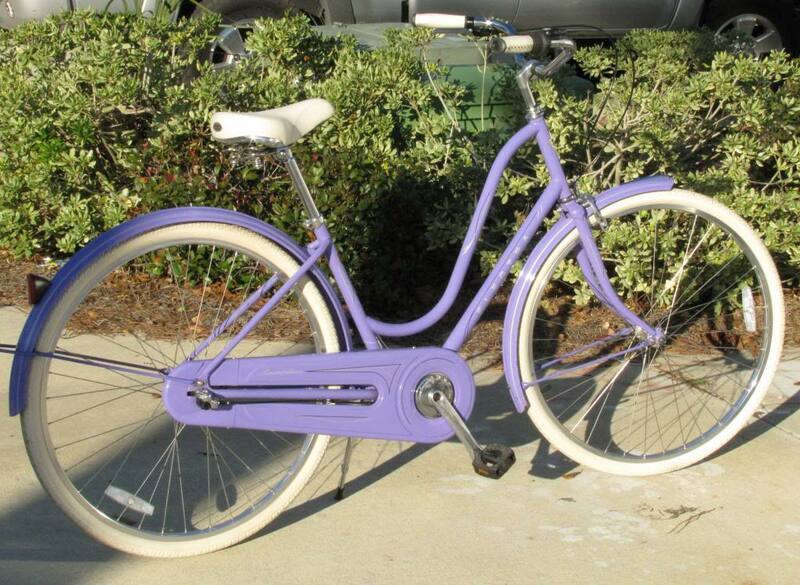 Years ago I bought my wife an Electra Amsterdam 3 spd. I enjoyed riding it more than she did. Last edited by SHOFINE; 03-18-19 at 04:41 AM. part of the confusion is because a lot of brand importers go to relatively few but huge companies, to gget their product made..
#1) pick a bike shop... there you get service after the sale,,that narrows down the brands too.. they have what they have..
My wife has had several bicycles, but she wanted to be able to put her toes on the ground without getting off of the seat. She was convinced that she didn't want a bike any more. Brought my wife to the LBS and they put her on an Electra Townie. She took it for a mile ride, and said "let's buy it." Every day she rides it, she adds a little distance. She is a bit timid riding it on the road. She is 72, and is really enjoying it. Sun Bikes, out of Miami, Chinese bikes, are pretty good, a little less $$ than Electra. I ride a 12 year old Sun Boardwalk every day, and I like it a lot. Let her test ride a Specilized Roll Sport...amazingly fun bike! We added fenders and other goodies. The Specialized Roll Sport looks fantastic! Do you have issues with "toe touch" when turning? 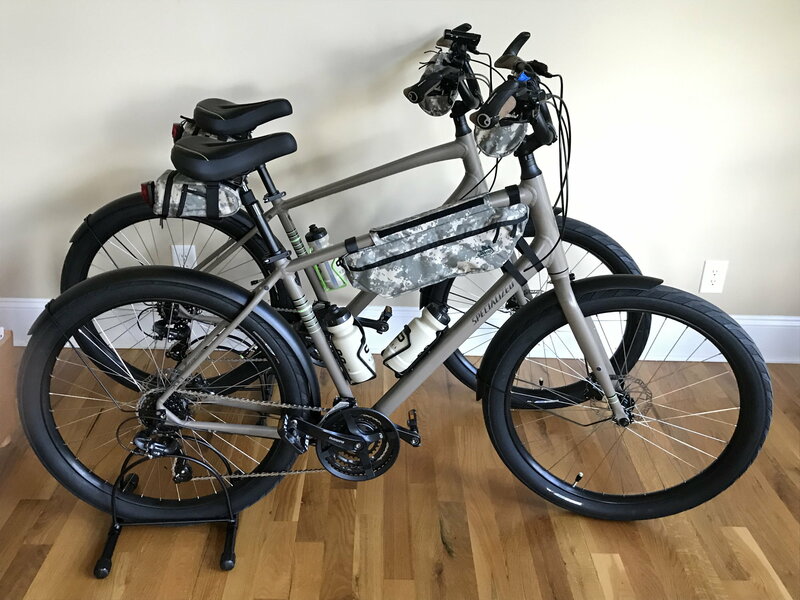 Jandd camo bags, and upgraded to Shimano Deore dual use SPD pedals and Shimano hydro brakes. 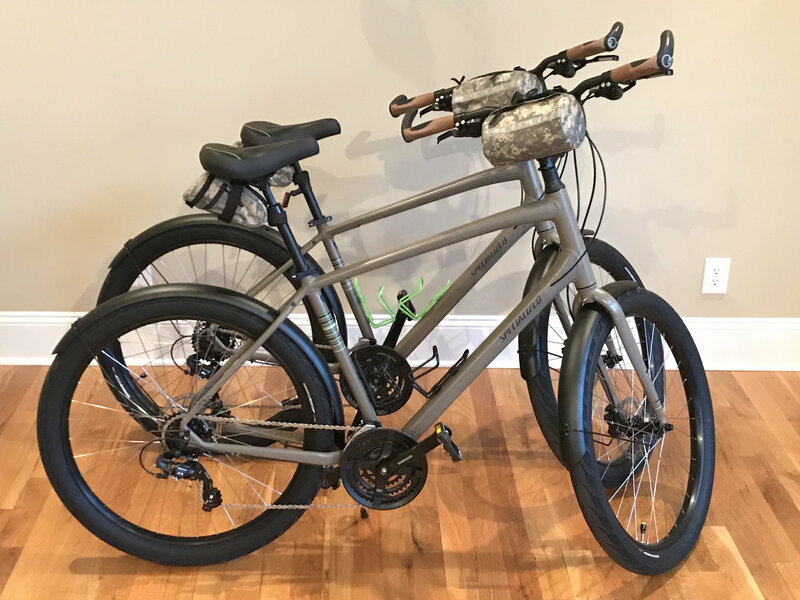 Fun, really comfortable bikes! My XL and my wife’s L closest to the wall. Last edited by Patriot1; 03-18-19 at 02:11 PM. Shimano Deore dual use SPD pedals and Shimano hydro brakes. Thanks! Customizing is fun, I don’t think you would be disappointed buying a Roll. I would buy these bikes again! Ordered (2) Jandd frame bags in digital camo. Waiting on Quadlock pros to arrive to mount our IPhones. All kinds of good suggestions, and probably I'll get torched for this, but I got a Bikes Direct cruiser for my daughter (she wanted an electric bike, and they had one without a front fork for very cheap and I was fitting a front fork and hub motor anyway), and I was surprised by the quality of the frame and most components. Post up a few pics when you complete the build. Maybe a overall review? No torch here. Thanks. E Bikes, last page; post dated 1/18/19. May move the battery to the down tube. Last edited by 2old; 03-20-19 at 12:53 PM. Update (couldn't just add above); doesn't fit between the frame tubes. Will procure smaller battery when this one expires.